Women know what it means to have little or no voice in influencing decisions that affect their lives. 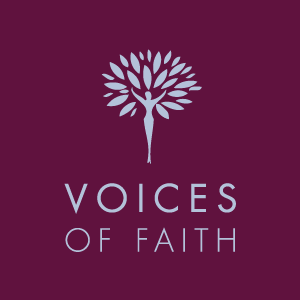 Voices of Faith aims to bring together leaders in the Vatican with the global Catholic community, so they can recognise that women have the expertise, skills and gifts to play a full leadership role in the Church. Live stream from inside the Jesuit Curia, Rome on International Women's Day! Hear powerful stories from women across the globe on why women matter and the need for female leadership in the Catholic Church. We live in times marked by change, but there are places where gender equality is being systematically overlooked. The Catholic Church is one of them. Today, women are asking why the Church is so slow in recognising their value and opening governance and ministerial roles to them; roles that incorporate their faith, gifts, expertise and education into structures of authority at all levels. Our world is facing a future more meaningful by the inclusion of women in significant positions. We will not let gender inequality undermine the longevity of the Church. Our voices stir the winds of change, so we must speak. Will Pope Francis and our pastoral leaders listen? Mary McAleese grew up the eldest of nine children in a tumultuous time in Northern Ireland. Her family was forced to leave the area by Loyalists when The Troubles broke out. She was the first Irish President to come from Northern Ireland and the first woman to succeed another woman as the eighth President of Ireland from 1997 - 2011. An outspoken advocate on many issues concerned with justice, equality, social inclusion, anti-sectarianism and reconciliation it was no surprise the theme of her Presidency was 'Building Bridges'. Mary graduated in Law from the Queen's University of Belfast in 1973 and was called to the Northern Ireland Bar in 1974. In 1975 she was appointed Reid Professor of Criminal Law, Criminology and Penology at Trinity College Dublin and in 1987 she returned to her Alma Mater, Queen's, to become Director of the Institute of Professional Legal Studies. In 1994, she became the first female Pro-Vice Chancellor of the Queen's University of Belfast. In 2013 she received a master's degree and licentiate in canon law of the Roman Gregorian University. 8 March 2018 at the Jesuit Curia, Rome. 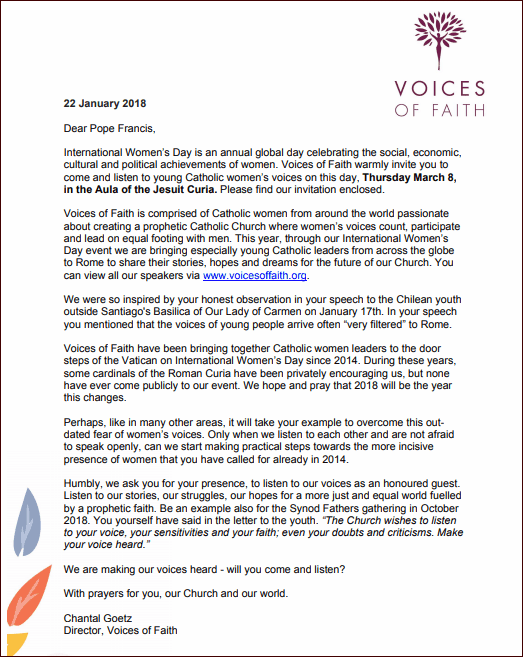 Today we hear catholic voices from across the globe speaking on women and leadership in the Catholic Church. The time for change is now. Zuzanna Radzik is a Catholic theologian who graduated from the Pontifical Faculty of Theology in Warsaw and the Hebrew University of Jerusalem in Israel. She specialises in Christians’ relations with Jews and researches Catholic feminism. Zuzanna regularly contributes to the Polish Catholic Weekly ‘Tygodnik Powszechny’ and in 2015 published Kościół kobiet, “The Church of Women” highlighting feminist efforts in the Catholic Church from various countries and cultures. Zuzanna will speak personally about her own journey and desire as a young faith leader to build bridges that do not ignore the past yet look forward to a brighter more inclusive future for women in the Church. We live in times marked by change, but there are places where gender equality is being systematically overlooked. The Catholic Church is one of them. Today, women are asking why the Church is so slow in recognising their value and opening governance and ministerial roles to them; roles that incorporate their faith, gifts, expertise and education into structures of authority at all levels. Rev Thomas H Smolich SJ, International Director Jesuit Refugee Service - from inside the Jesuit Curia, Rome on International Women's Day.